Lab Brats is a rare minigame found in Mario Party 6. Its name is a pun on "lab rats", which are rats used for scientific researches. 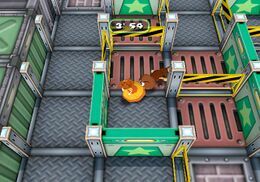 In the minigame's introduction, Professor Elvin Gadd states that he invented a maze-making machine, called the Maze Manufactory. He taunts the player, saying that they can't solve the mazes before time is up, then he wishes the player good luck in solving them. The aim of the game is to reach the end of five mazes in five minutes. It is one of the only three 1-player minigames available in Mario Party 6. On every level, the player can also find another character wandering around: these include a Penguin, a Ukiki, a Koopa, a Goomba, and a Shy Guy. Only one appears on each floor, and they appear in a random order. Though they do not help the player directly, finding them contributes to the player's rank. A trampoline propels the player to the next maze. At the end, E. Gadd gives the player a rank, as high as 16 and as low as 1. Rules – "Find the end of Prof. E. Gadd's maze! You get a rank based on your speed and how many friends you find." Advice – "Use the overhead view to find the path to the exit and where the lost characters are." This page was last edited on October 7, 2018, at 07:43.